Safety in operation is assured, as all vessel are manufactured accord ASME Section VIII Codes. All external welding for seams are performed by automatic welding equipment. A dry vessel is assured, as all water is removed during the hot air drying process. Liquid boil out coil (Vaporizer) are provided if this option is purchased. Add 15% to the above capacity rating if ther liquid make up temp. is 0℃ or below. ITC creates this phenomenal Pressure Vessel Accumulator, following the ASME Section VIIl codes. We build it for storing both liquid and gas ammonia, and promoting the temperature regulation. Our engineers designed it to working tolerate the pressure of 16 Bars (g) ; and tested pressure endure 24 Bars (g). And also, although an optional liquid boil out coil vaporizer was designed working pressure 20 Bars (g), and this coil tested pressure 30 Bars (g). 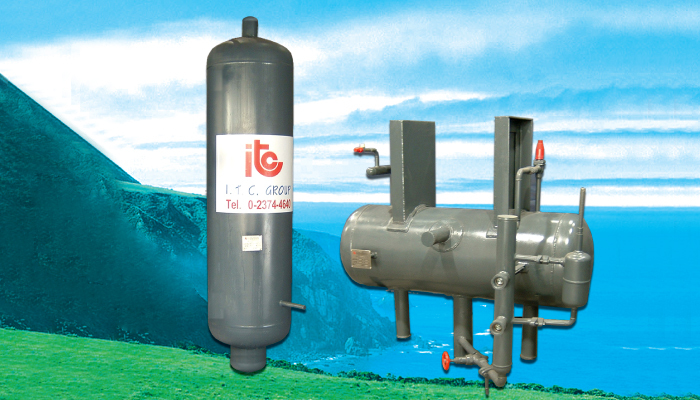 In addition, suction gas equipment, safety valve and mist eliminator can relieve the pressure inside the vessel. While only allowing ammonia gas to pass through the compressor, these instruments also prevent the liquid from penetrating to the compressor. ITC, therefore, would like to offer you this premium quality accumulator at very reasonable price.